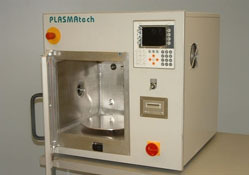 Standard Equipment :: Plasmatechnology Inc.
PLASMAtech's AL Series is designed for R&D and low to moderate volume production. Chamber sizes range from 10×8×8" to 18×18×20". The systems are clean room compatible and available in table top or free-standing configurations that allow incorporation of the vacuum pump within the cabinetry. Easy operation and repeatable processing are ensured with standard features like PLC control, precise gas metering via mass flow controllers, error monitoring, recipe chaining and operator lockout. Many optional features are available on the AL systems including additional MFC's, paperless process data recording/downloading, and rotating drums for bulk parts. The systems can also be supplied with thin film deposition (PECVD) capability.